Set in small-town Kentucky, this coming-of-age story depicts the ups and downs of 14-year-old Ricki Jo Winstead as she tries on a new identity. High school is about to start, and Ricki Jo seizes the opportunity to reinvent herself. The first thing she does is ditch her “plain ol’ ” name, taking on the new, more sophisticated (to her ears) moniker of Ericka. Swiftly getting the lay of the high-school land, Ricki Jo decides that she wants to move with the popular girls. She tries out for cheerleading rather than band, buys hipper clothing and jettisons the real Bible for that subversive gospel according to Seventeen. Her new friends are a little faster than she’s used to, and she begins a rather daring (for her) flirtation with the handsome-and-he-knows-it David Wolfenbaker. All these changes displease her neighbor and best friend, Luke Foster, a grounded guy who is struggling with the more serious issue of his father’s alcoholism and abuse. 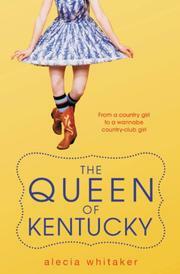 In her debut, Whitaker paints a vivid, finely detailed picture of life in the sometime-hardscrabble heartland. But what draws the reader in is the chaotic precision of her characters, youngsters who are conflicted and frequently inconsistent, yet feel rounded and real.